Srinagar, Feb 12 (KNS): Expanding the insurance options further for its customers across the state and beyond, J&K Bank today entered into a tie-up with IFFCO-Tokio General Insurance - a joint venture between one of the world’s biggest cooperative society, Indian Farmers Fertilizer Co-operative (IFFCO) and the largest listed insurance group in Japan, Tokio Marine Group. The agreement between the two leading companies was signed in presence of Chairman and CEO Parvez Ahmed and Managing Director IFFCO Tokio Warendra Sinha, Director Marketing Anamika Roy Rashtrawar and Director Operations Jun Matsui here at the bank’s Corporate Office. 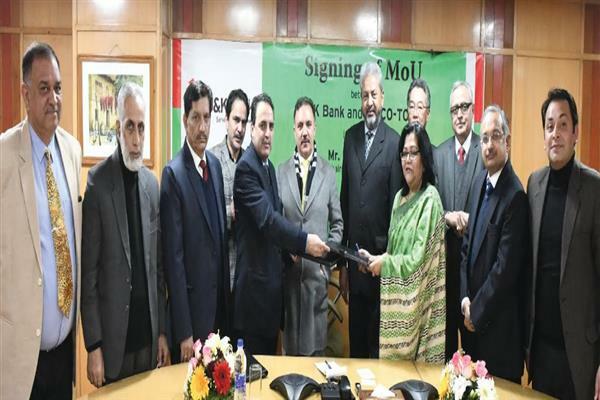 The bank’s President Insurance M Younis Patoo signed the MoU on behalf of the bank while as Anamika Roy Rashtrawar put in her signatures representing IFFCO Tokio. Vice President Vibhakar Khajuria extended vote of thanks and commended the prudent decision of the management for roping in IFFCO- Tokio General insurance company to provide best in class service to customers. Director Marketing IFFCO Tokio Anamika Roy Rashtrawar while thanking the bank expressed hope that the common thread between both the companies is that we both understand the difficulties of the common people and we would work in tandem to address their concerns. Incorporated in 2000, IFFCO-Tokio General Insurance is a joint venture wherein IFFCO holds 51 percent in the company and the remaining 49 percent is held by Tokio Marine Group.